Whenever I see prawn noodles, I think back to the times when my parents brought all of us to the prawn noodle stall near Pasir Panjang, along the shophouses at the main road headed towards Haw Par Villa. I can’t remember exactly where the shophouses are located now but I’m sure I will be able to recognise it if I were to head down again. My parents loved the prawn noodles – the prawns were large tiger prawns and very fresh ones too; the broth was tasty and infused with the pork rib fragrance. The only thing they complained about was the cost. A bowl of prawn noodle could cost between $8 to $10, which is a lot of money back then. Sadly, I can’t remember much of how the noodles tasted and what made them so unique and famous. 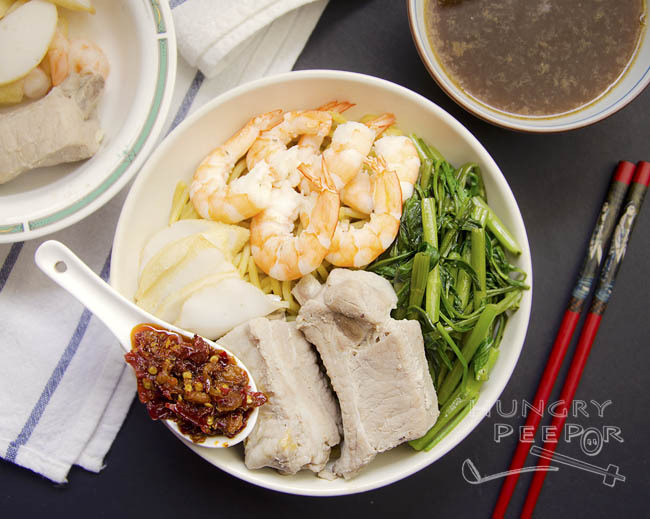 Growing up, I have also tried a few other stalls that sold the Singapore version of prawn noodles – one at Zion Road and the other, which is now defunct, along Bukit Ho Swee Road. What I do remember and like most about prawn noodles is the dry version of the dish, as well as the chilli paste that goes so well with the noodles and the broth which is always deeply infused with the taste of prawns and pork ribs. This, I believe, is the biggest part of my motivation for wanting to re-create this similar taste at home. I’m already having thoughts about going back to the childhood prawn noodle stall to revisit the taste that lingers at the back of my mind. Hopefully, soon, when the little kiddo grows up to be older and a bit more adventurous in taste. As for now, let’s just have a try at my own home-made version first. Cook prawns in boiling water. Set aside to cool, then de-shell and set aside both prawns and shells. Quickly blanch pork ribs in boiling water to remove the blood. Set aside. Heat oil in wok. Stir-fry shells on high heat till soft. Add anchovies and brown sugar. Fry on low heat for 2 min. Add garlic and fry for another 1 min. Transfer to a pot. Add water and bring to a boil. Add cloves, black peppercorns and star anise. Place pork ribs back into pot. Simmer soup for 30 min. Sieve soup to remove shells, spices and scum. Return to stove. Mix in dark soya sauce, salt and white pepper. Blanch yellow noodles in soup for 1 min. Scoop out into a bowl. Blanch kang kong and bean sprout for 30 sec. Scoop out and serve on top of noodles. 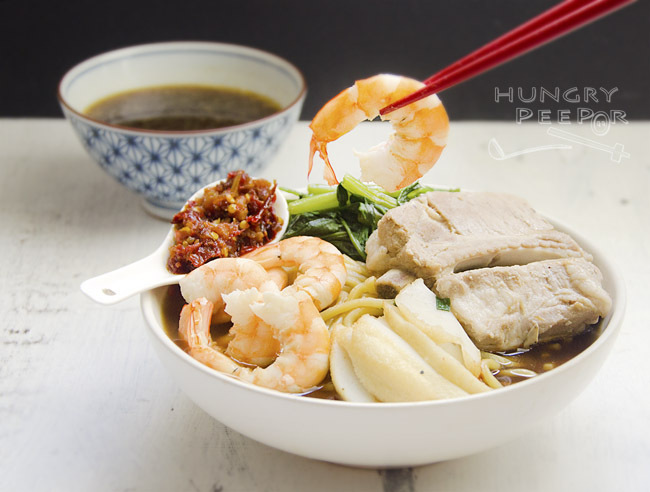 Top noodles with fish cake, prawns and pork ribs. Pour soup over noodles. Serve hot with sambal chilli. My favourite would be to serve the noodles dry and the soup in a separate bowl. Mix the sambal chilli into the noodles, together with a bit of soya sauce and black vinegar to serve. Blanch all the ingredients in the same pot of soup to get a deeper flavour of the prawn soup in one single bowl! 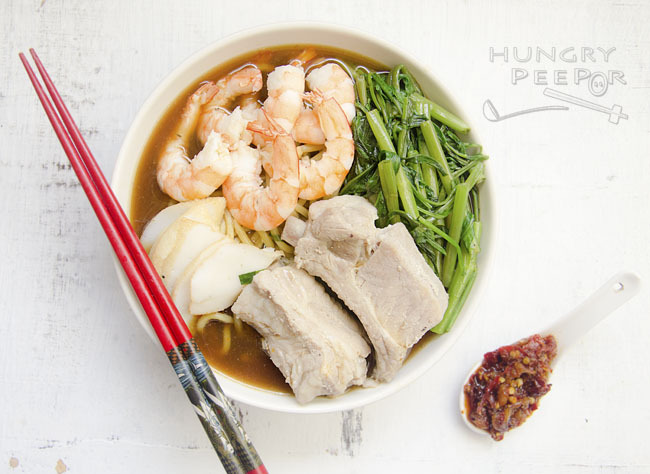 This entry was posted in Chinese, Noodles and tagged Hokkien, Prawn, Singapore, Soup. Bookmark the permalink.